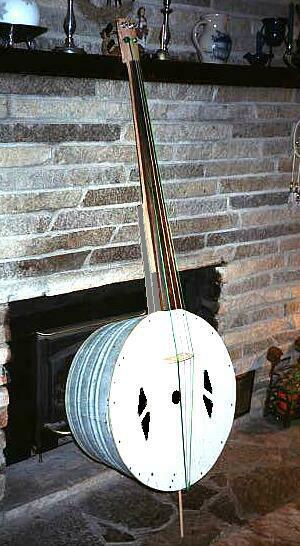 Build a real, 4-string upright bass using an upright washtub. NOTE: 27 additional photos (plus 17 photos of basses other people built) and a sound sample of this instrument are available. Click here for information. other instruments. String length is 40". Click here for a photo of this instrument (just before painting the soundboard and the "main support" black). Click here for construction details. Click here for photo of tub inside with soundboard removed. just such a flat for the lowest string & that works fine. difficult part of building my bass is making the "curve"
going from curved to flat playing surface is negligible. same overall thickness as in the original design. allow for enough room to be able to wind the strings on the tuners). make. I scrounged the tub (they sell for $16 at the local farm store). historic display at the fort I work at -- etc etc. the instrument itself. I lucked out & discovered .080", .095"
three strings of the instrument (G, D and A). which actually sounded pretty good! into a nice looking round "cable" -- sounded "thuddy"! at http://www. lehighgroup.com. Experiments on this front continue. wound strings myself. The process is quite easy. encourage anyone interested to build one! all flatwound" bass strings (from Elderly Instruments). straight-forward -- nothing much complicated or fussy. - String width at nut is 1  1/4", at bridge it's 3  5/16". - Fingerboard width at nut is 1  1/2", at bottom end it's 3  5/8". fingerboard to top of soundboard is about 1 13/16". - String length is 40"*. 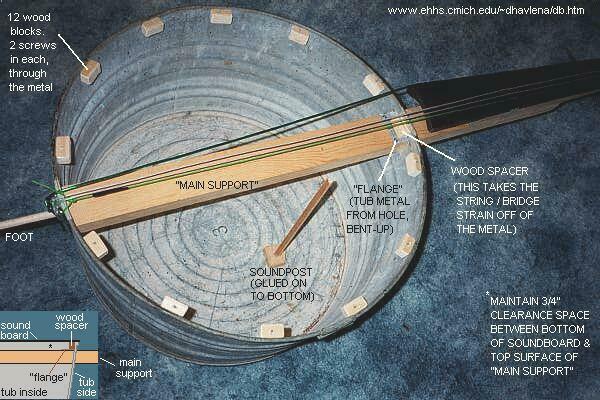 wooden block snugly into the 3/4" space between the "main support"
the strings/bridge & is scarcely "seen" by the tub. illustration & one larger 1  3/4" hole in dead center. increases the overall volume of the bass. enlarge the string holes in the posts for the thicker strings. Click here for information on building this "Doodle-Bass". Remove the handles on the washtub lest they vibrate mercilessly. Click here for information on building Bill Koch's oblong-tub version of my design. Click here to return to my webpage * A few words about string length. I settled on a 40" string length largely because that is what's played most in this part of the Great Lakes. I've been trying to pin down what might be considered a "standard" string length, but have become very convinced that no such standard exists. Information from countless sources shows no general consensus -- with string lengths varying from 39-1/2" to 42"! In any event, this instrument can easily accommodate whatever string length you desire -- just slide the bridge forward or back.